A FLIR thermal imaging camera was employed by a group of Dutch students during the development of a solar car for participating in the World Solar Challenge in Australia. Held every other year since 1987, the World Solar Challenge is a friendly competition with participation by teams from all over the world. The teams set out from Darwin with their own designed and built solar cars aiming to be the first to arrive in Adelaide, about 3,000km to the south. Solar Team Twente is a group of 16 students from two Dutch Universities, the Saxion University of Applied Sciences and the University of Twente. A team of partners and advisors, as well as a large group of college and university students are involved in the project to gain new experiences and win the challenge together. Thermal imaging is one of the techniques applied by the team for the development of the solar car. Seeking to use this technology from the beginning of their solar car development, the team approached FLIR Systems to make available a thermal imaging camera for their ambitious project. The team planned to use thermal imaging during the development of the solar car to confirm that the different parts of the car worked according to calculations, and as per the specifications defined by the organisers of the World Solar Challenge. Chiel De Wit, Chief Product of Solar Team Twente explains that the car, for instance needed to be brake-tested to ensure it would come to a complete stop within a certain distance for safety reasons when driving at an average speed of 50 km/h. A mock-up of the solar car was taken to a nearby airport, where using the thermal imaging camera, the increasing heat of the brake discs was measured at different speeds so that it could be confirmed these met the specification set in the regulations. The engine of the solar car was also inspected with the thermal imaging camera when testing its maximum capacity. According to Jelle Wagenvoort, Technical Manager and member of the management team of Solar Team Twente, energy efficiency across various components was key to winning the race as more power would be available to drive the solar car. The FLIR thermal imaging camera was used to test the electronics of the car to identify the parts that consumed the most power and assess whether they could be replaced or modified. The use of thermal imaging cameras for solar panel evaluation enables various anomalies to be clearly seen on a crisp thermal image. Very importantly, unlike most other methods, thermal imaging cameras can be used to scan installed solar panels during operation. De Wit explains that a nominal loss of electricity production can occur when photovoltaic cells in a solar panel are damaged. He adds that it is very important to make sure the solar panels are in excellent condition before starting the race, as well as during the race so that defective solar panels can be repaired or replaced. FLIR’s handheld thermal imaging cameras are widely used around the world for capturing and recording thermal distribution and variations in real-time, allowing engineers and researchers to see and accurately measure heat patterns, dissipation, leakage, and other temperature factors in equipment, products and processes. The FLIR T450sc thermal imaging camera can distinguish temperature changes as subtle as 0.04°C. Featuring state-of-the-art detector technology, the camera uses advanced mathematical algorithms for high performance and precise measurements from -20°C to +1500°C. Solar Team Twente used the FLIR T450sc portable thermal imaging camera with a rotating optical block, touch screen interface and a 320 x 240 pixel resolution. Handheld thermal imaging cameras such as the FLIR T450sc are perfect for dynamic testing in the field. Wagenvoort pointed out that the thermal imaging camera was very convenient to use while carrying out different tests at different locations. Though they were working with a thermal imaging camera for the first time, they were very pleased with the quality and accuracy of the thermal images. De Wit comments that the thermal imaging camera has helped them a lot during the development of their solar car, allowing them to confirm the working of various parts. 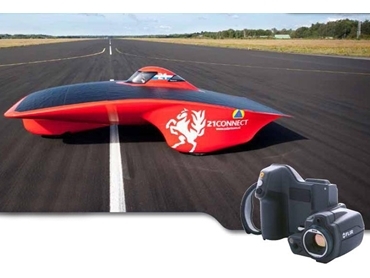 Wagenvoort adds that the use of a thermal imaging camera is not only a valuable technological addition in the development phase of the solar car, but also during the race. The team plans to win the race within four days and the FLIR thermal imaging camera will be used constantly while servicing the car during the race including inspecting the solar panels and identifying electrical components that will need cooling. The Solar Team Twente is confident that the solar car developed with the help of thermal imaging will give them a head start in the competition. A wide range of thermal imaging cameras is available in Australia from FLIR Systems Australia .